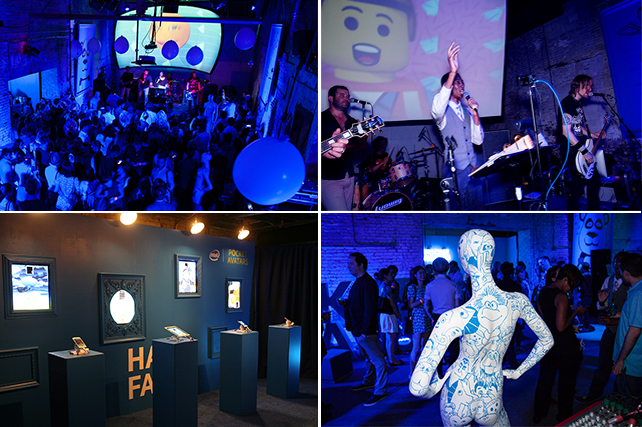 An evening of cutting-edge technology, live-band karaoke, food, fun and avatars. Pocket Avatars is a new fun messaging app from Intel that utilizes cutting edge facial tracking algorithms to render your expressions & voice onto an array of fun-loving avatars. To celebrate the launch, we threw an Avataraoke party in NYC, complete with food and drinks, where our guests could perform karaoke as your chosen avatar with Arlene’s World Famous Live R&R Karaoke Band. Approx. 200 people came at the Intel Party in Brooklyn in a cool venue and atmosphere designed toward younger NY crowd, positioning Intel & Pocket Avatar as culturally connected. Crowd had a blast singing & cheering on singers for 2 hours, did not tire of entertainment of watching avatars. Technology worked flawlessly, and demonstrated on huge screen the unique capability of app. Creative Animation drew interest from street with people taking video of billboards. 4 teams in Intel branded Pocket Avatar t-shirts engaged people to try out the new app on tablets, demonstrating product is real and chance to try out. Hundreds were engaged, often surprised but positive that app came from Intel, delighted by the give-aways. (300 shirts given). Adults looking in to technology performance tracking. Blown away it worked so well. Liked politicians to make them say silly things. Kids were excited as a new “toy and played with it. Annoying Orange and Lego were hits.